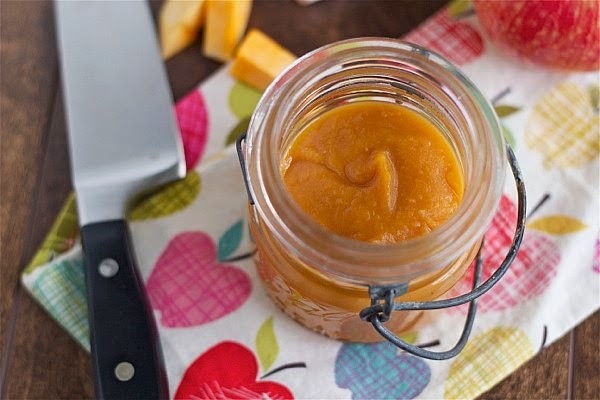 Slow cooker sweet potato applesauce: only two ingredients, one crockpot and zero added sweeteners to create this easy riff on applesauce that has an endless number of uses. Peeps, I am so excited about today's post -- inordinately so, but hey, sometimes it's the little things that make my day. Why am I so excited? Because I had an aha moment that turned out to be super sweet. Literally. I had a bunch of apples from my fall apple haul leftover and decided to make my favorite, no-effort slow cooker applesauce. But I also happened to have a couple of sweet potatoes. And you know how apples get sweeter when you cook them into mush? SO DO SWEET POTATOES. At that moment, this sweet potato applesauce was born. And it couldn't be easier to make: two ingredients, one crockpot, zero effort. Well, nearly zero -- you do have to peel the potatoes and peel and core the apples. But after that? Just load up the crockpot and watch the magic happen. 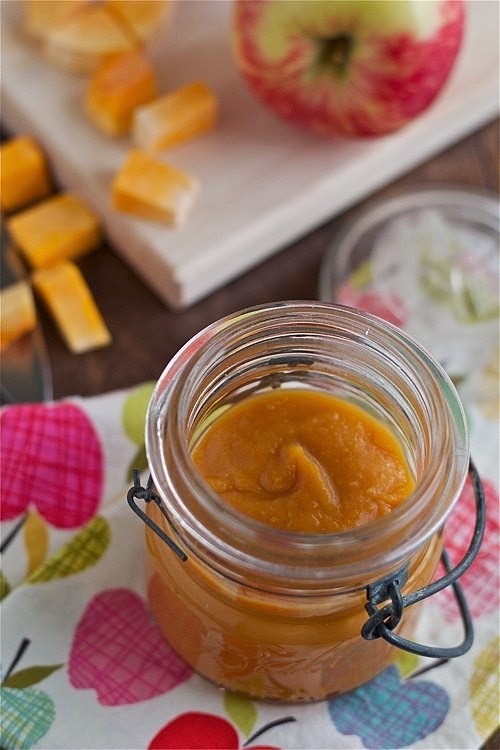 You can use this sweet potato applesauce any way that you'd use regular applesauce. I've been baking with it (check out my two-ingredient applesauce muffins! ), stirring it into plain yogurt for breakfast, using it as a sweetener in my homemade granola recipe and turning it into fruit leather (ZOMG, talk about a great snack for kids -- you don't need to add a single thing, just spread it out and dry it!). Plus, I popped some into the freezer to enjoy during the cold winter months. Unlike my crockpot applesauce, I didn't add any cinnamon or other spices to this sauce, as I was trying to keep it "neutral" for baking purposes, but feel free to get creative: in addition to cinnamon, try some nutmeg, clove or even a dash of cardamom. 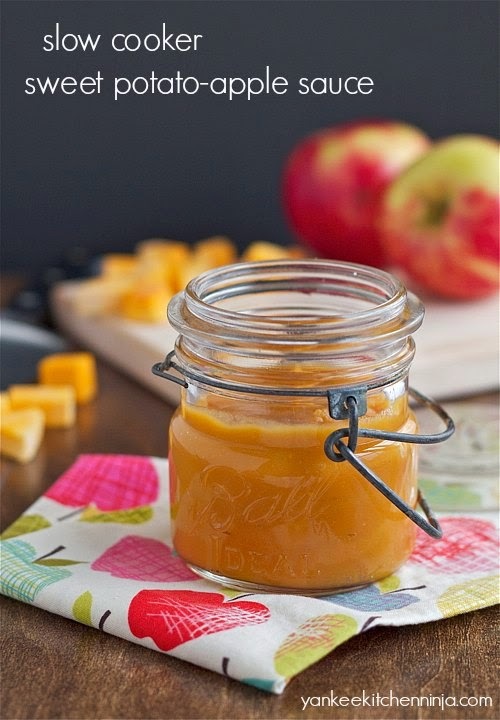 How would you use this sweet potato applesauce, especially with the Thanksgiving holidays approaching? Leave a comment: The Ninj wants to know. The number of apples and sweet potatoes required will vary, depending on the size of your slow cooker. Just keep the ration at about 2/3 apples and 1/3 sweet potato. Place the ingredients in a slow cooker, cover and cook on HI for about 3 hours or LOW for 6-8 hours until well softened. Blend with an immersion blender unless you prefer a chunkier texture. Cool and store in the refrigerator or freeze. Hope you enjoy it, Emma! I love that it's self-sweetening. Wow, this sounds wicked good. I don't use a lot of applesauce, so I have no idea what I'd do with it. I love the idea of using it in a bread, that sounds really yummy. I'll have another baking idea for using it posted next week! I absolutely love this! I love the texture and it sounds so, so delicious. Totally making this!!! And it's super easy, Susan -- enjoy! I have never ever made applesauce it sweet potatoes. Since this is a slow cooker recipe I just might give it a try! I'm sort of addicted to my slow cooker. I would imagine I could bake with this when I make my applesauce recipes. Thanks for this! I'm a slow cooker addict, too, Dionne -- especially at this time of the year. And this is a very cool sub for applesauce in baking recipes! Thanks, Jenn -- hope you give it a try! Jeez..I am eating that directly from the pot! I supposed if I need to be civilized I will putting on poultry that looks darn delicious and SO easy to make! This is such a creative idea! I've never thought to put sweet potatoes into an apple sauce before. MAJOR aha moment over here now too! This is such a great idea! I bet it would be amazing with a slice or two of seared pork tenderloin. Agreed, Eileen -- it's perfect for pork. This strikes me as a no brainer for kids. My daughters would be all over this. Love hearing about how it came to be. Thanks, Katie -- I'm sure your girls would love it!